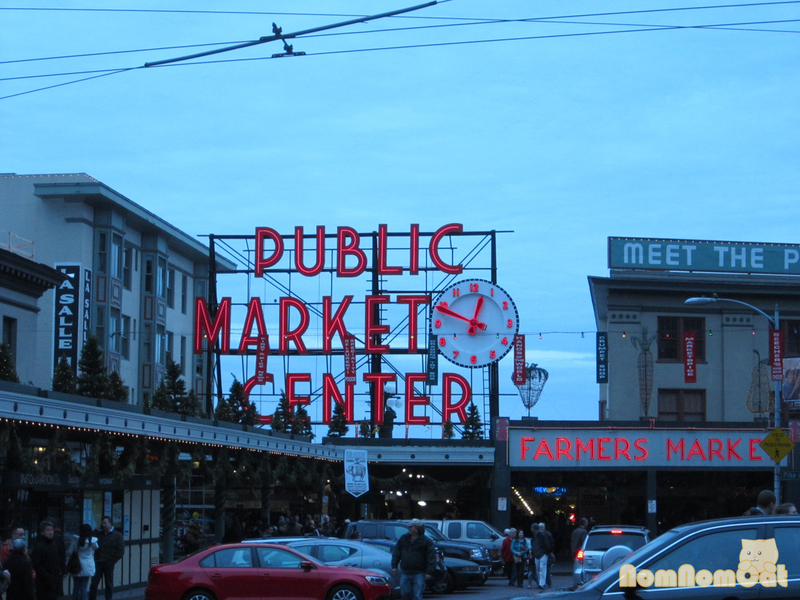 We allotted a whole afternoon to exploring Pike Place, the iconic farmer’s market of downtown Seattle, so we thought it would warrant its own entry in our One Week, Three Cities series. 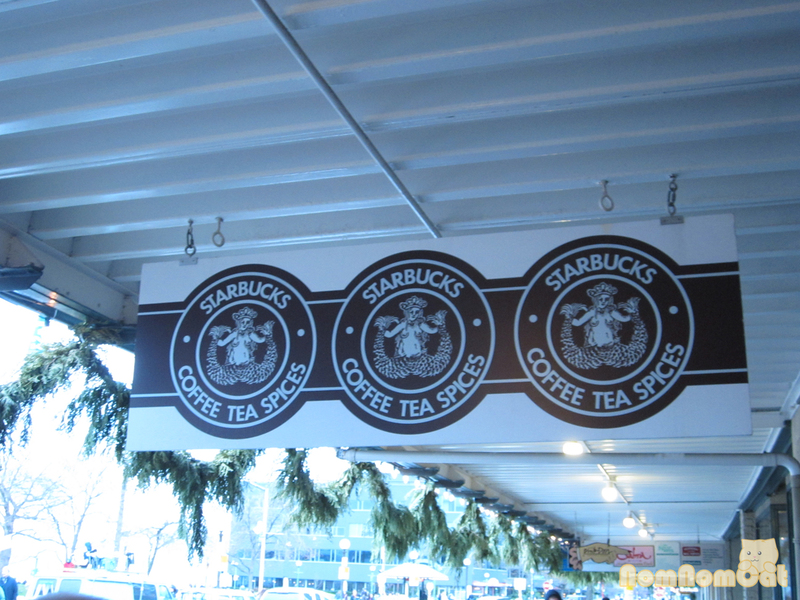 Our first stop – the first Starbucks, of course! The line was out the door, but we (well, mostly Martin) were there to pay homage to this mecca of frappuccinos and chai lattes. The drinks are exactly the same, so this visit is really all about the novelty of the experience. Making our way back to the main entrance to the Market, lattes in hand, we spotted a sign for La Buona Tavola. Brittany at the Seattle Caviar Company had told us about a great truffle shop near Pike Place, and we knew we were in the right place. Rei H., the Truffle Queen, was so welcoming and helpful. 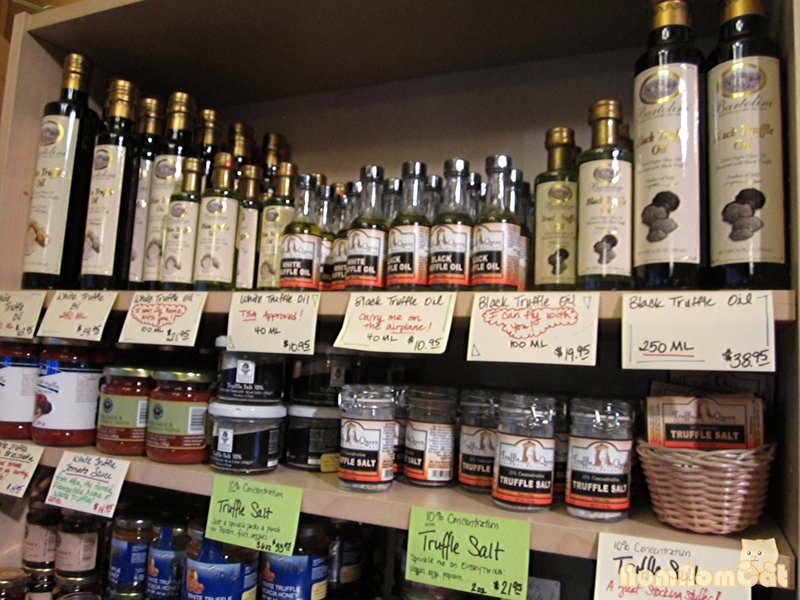 The store was quite crowded, but after asking her a quick question about the varieties of white alba truffle oil they had on the shelves, she went and set up a mini tasting just for us – a little shot glass sized cup of potato soup. First a sip of just the soup. Then she added a full dropper (1 mL?) of truffle oil and had us try again. Foodgasmic! We also partied it up with tequila shots (just kidding – but she did have us lick the back of our hands to try the truffle salt). 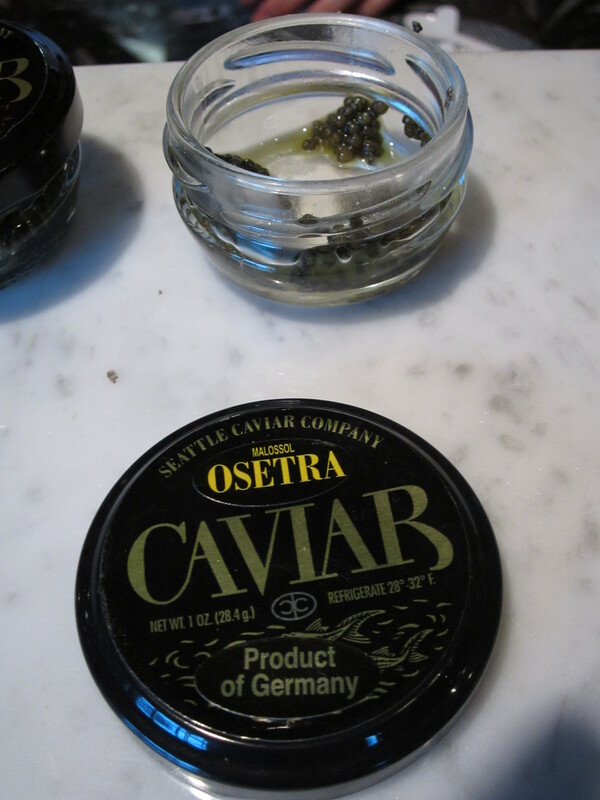 Another fascinating product they carry – truffle caviar. The fishy flavor and dark tint come from squid ink, and the synthetic pearls very closely resemble “true” caviar. For our dessert tasting, a 1:2 ratio of white truffle cream to a Nutella-like chocolate hazelnut cream. YUM. We couldn’t resist – we left the store with a TSA-friendly bottle of white alba truffle oil and a packet of 10% concentration truffle salt. We’re definitely looking forward to using these gourmet ingredients soon! Onward to the main atrium of Pike Place — the Pike Place Fish Market, where enthusiastic yells and tossing of salmon attracts thousands of visitors daily. A bit of a tangent here – my mom collects magnets from every state she has been to, so I’ve made it a habit to pick up some magnets during my travels for her refrigerator. My dad, however, is far less of a souvenir-receiving kind of guy. BUT – the last time I went to Seattle, I brought back some salmon jerky and he loved it. To this day, I think he considers it one of the best and most useful gifts I’ve given him. This time I made it a point to pick up some more so we flagged down one of the guys to scoop up a 1/4 lb for me. They store it in whole strips — you can see the long backside of the salmon, just like the fillets they sell at your local grocer. Awesome stuff. At Rei S.’s suggestion, we stopped by Market Spice. Before you even enter the storefront you can smell the fragrance of dozens, nay, hundreds of spices and teas wafting through the air. 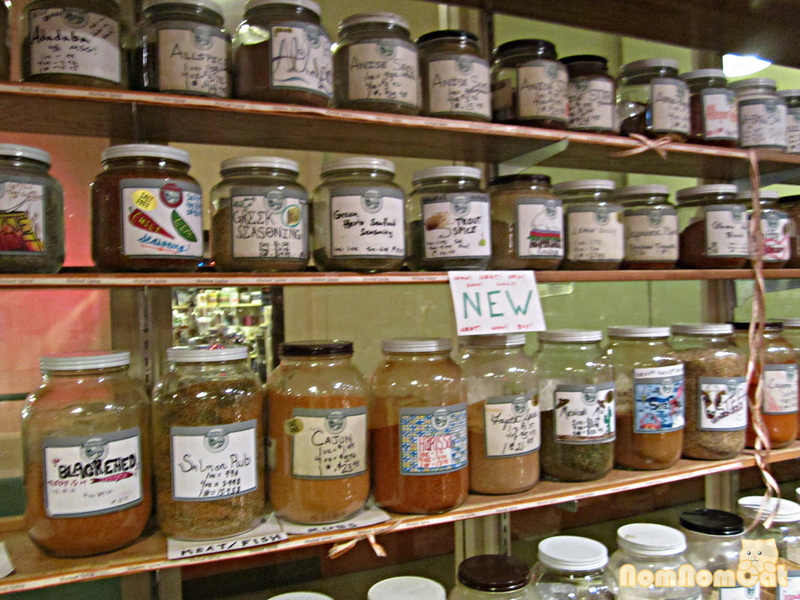 Upon entering, you can’t help but notice the floor-to-ceiling shelves of jars, each filled to the brim with spices and teas ranging from the ordinary pantry basics to the unique rub mixes, tea blends, and even catnip! 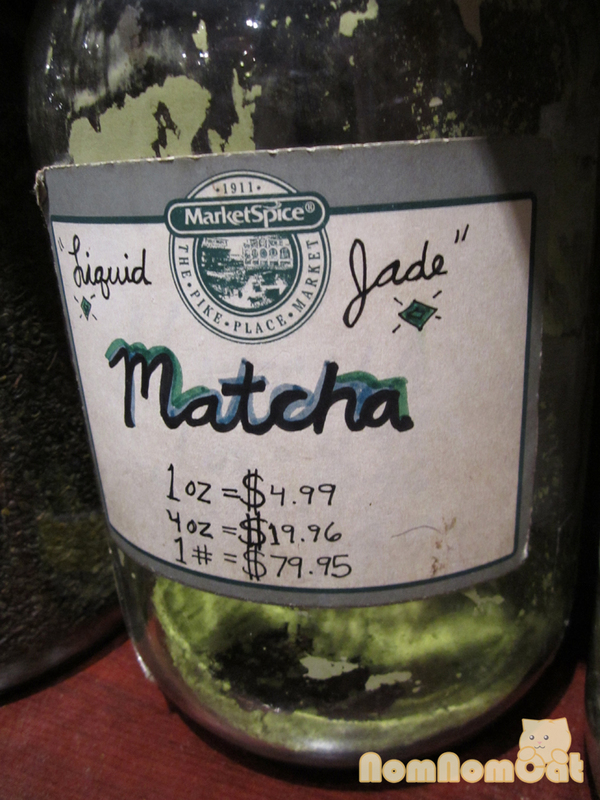 I couldn’t resist its beautiful bright green color, so I snagged a 1/4 lb of matcha. We also brought home some catnip as a souvenir for Percee. We spent hours wandering through the maze-like hallways and multiple levels that make up Pike Place. 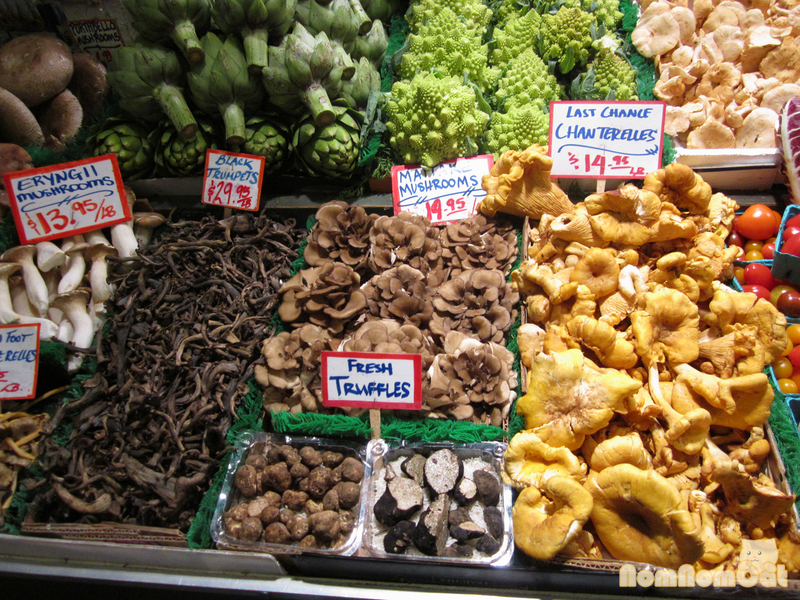 From fresh produce stands selling the last of chantrelles of the season to rows and rows of dried pastas in every shape, color, and flavor imaginable to artists selling their homemade wares, there really is something for everyone here. On one of the lower levels, there’s a comic book and assorted geekery store called Golden Age Collectibles as well as a numismatic (and baseball card collectors’) haven. Then once you’ve had your fill of the Market, you can cross one of the skybridges over to the Waterfront to check out the many restaurants, toy shops, arcade, and more! Sure it’s a bit touristy, but I can’t imagine a trip to Seattle being complete without stopping by for a latte at the first Starbucks, watching the guys toss fresh salmon at the Pike Place Fish Market, sniffing and gawking at all of the fresh fruits and vegetables, and exploring the nooks and crannies of Pike Place. Recommended by Alice’s friend Rei and conveniently located next door to the University Inn where we crashed for the duration of our stay in Seattle, Portage Bay Cafe was a “must visit” locale near UW. The line was already out the door by 10:30am on the day after Christmas, even though it was a Monday. The wait was about an hour long according to the hostess and we just about ready to leave when the hostess told us we could stake out a counter spot. Being from LA and highly familiar with restaurant lines, we did not hesitate taking the only two remaining counter spots next to the door and condiments table that nobody seemed to want. The service was a little slow as the kitchen and waitstaff were overwhelmed by the post-Christmas rush. I sadly played it safe with Phil’s Breakfast. 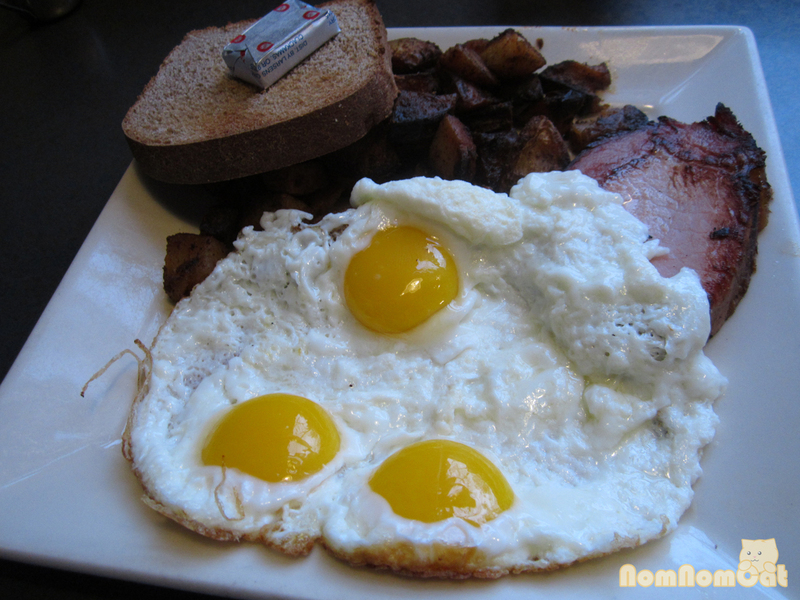 The bread and eggs were standard but the potatoes and molasses cured ham added more flavor to an American breakfast. The ham was sweet and had a nice smokey flavor yet a little chewy for me to finish. Potatoes were nicely seasoned with a heavy portion to get you ready for the day! As we glanced over the menu, it was difficult not to notice the large variety of French toast dishes available. Alice ended up choosing the crowd-pleasing Oven Baked French Toast. 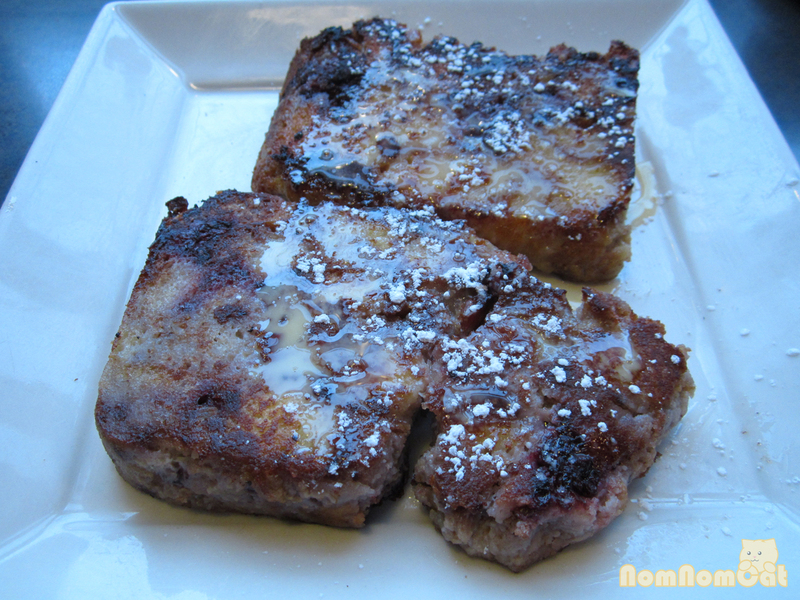 The Oven Baked French Toast very closely resembled a sweet, cinnamon-y bread pudding. It comes topped with a creme anglaise so no syrup was needed. The French toast comes with a “free pass” to visit the Topping Bar, essentially some large bowls filled with macerated or canned fruits sitting on a counter. 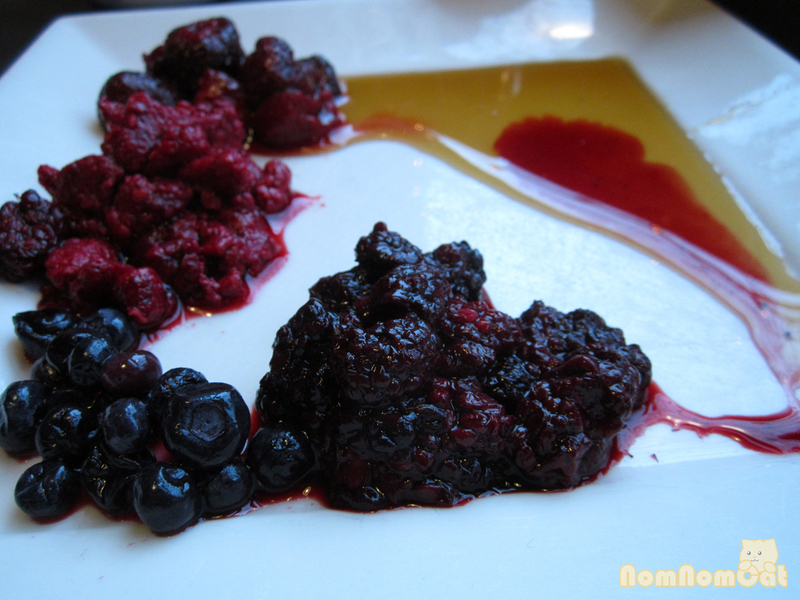 Alice decided to forgo the canned peaches and selected the four berries instead – strawberries, blackberries, raspberries, and blueberries. Very filling portions, reasonable prices, and extremely convenient especially if you’re a UW student, Portage Bay Cafe is a must visit. Best advice we can give is to not nitpick with seating availabilities, stake out a counter seat and save yourself at least half an hour. Easily an hour long wait for brunch on the weekends (or holiday weekdays). Now here’s an opportunity to try something out of the ordinary. 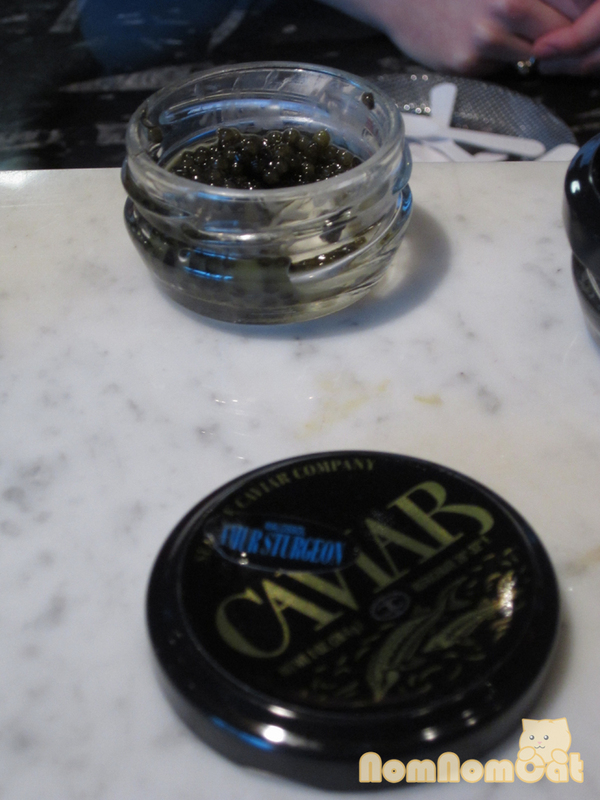 How often does one get to try a slew of caviar varieties ranging from classic sturgeon caviar and similar-to-beluga osetra caviars without breaking the bank? 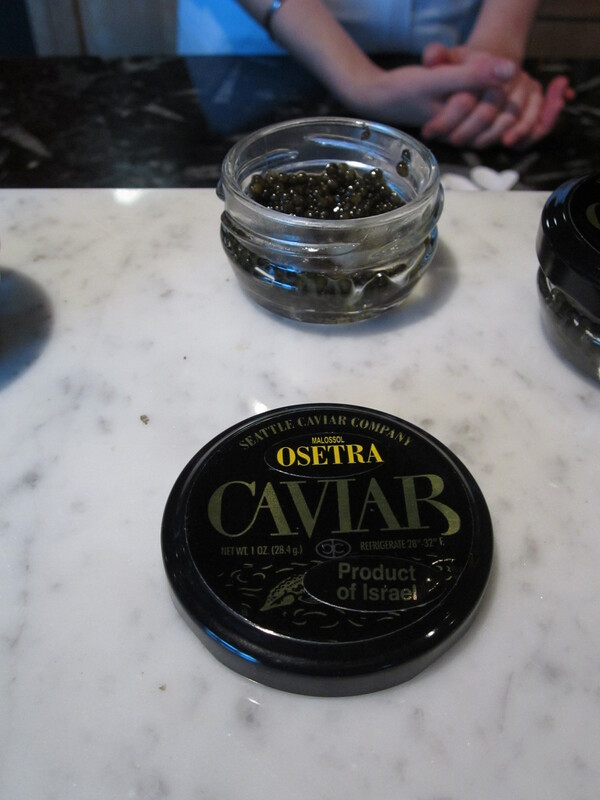 Reasonably priced at $10 / person, you could try 10 varieties, ranging from the $5 / oz of Chum Salmon Caviar to the Osetra Israel Caviar at $135 / oz. Add a glass of a delicious French champagne (or in our case, a Cremant) for an additional $10 / person. 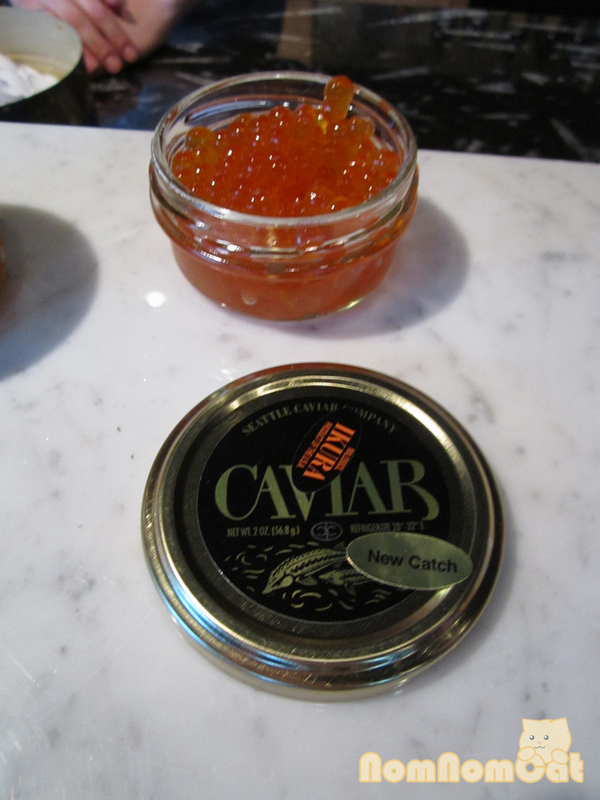 Note: We’re not caviar connoisseurs, so please excuse any poor articulations of caviar flavors and textures. A very familiar taste for us as it’s often used in sushi. Pops, nice and salty. 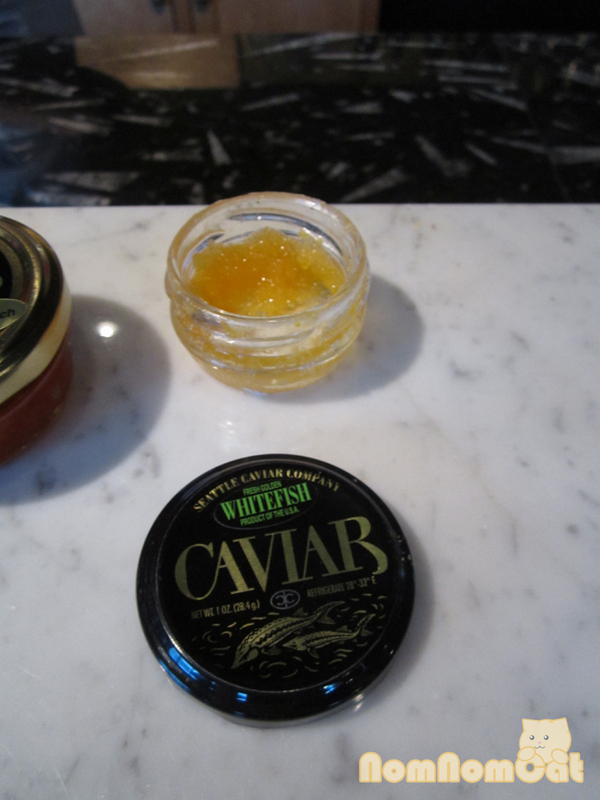 Similar to the salmon caviar but more buttery. Similar in texture to but slightly milder than tobiko (cod roe) used in sushi. Salty as the salmon caviar and buttery as the trout caviar, but these pearls are smaller and have less pop. Noticeably different flavor from the more familiar-tasting ones we started with. This was where it started getting very good. Saltier and nuttier than its Idahoan counterpart. This one had the most complexity thus far. It had a peculiar fruity and nutty flavor. A more buttery, subtle version of the Israeli Osetra. This turned out to be our favorite of all of them. 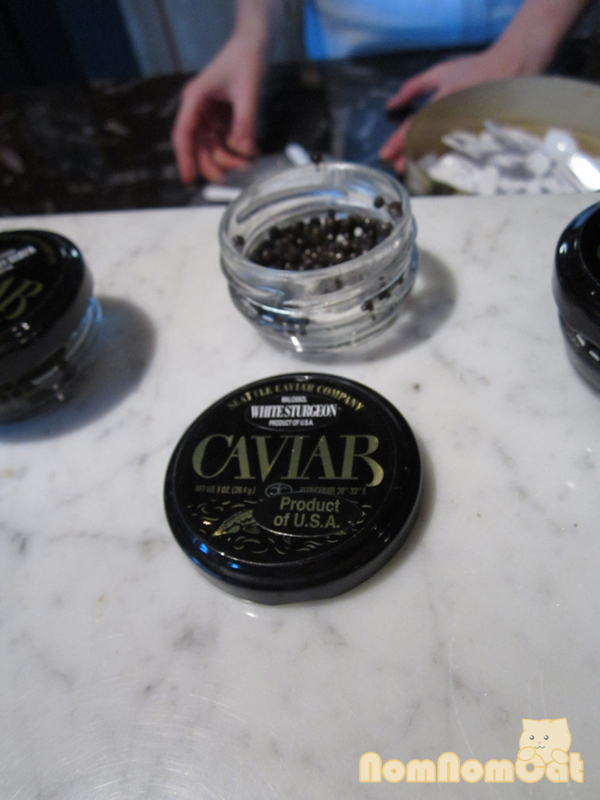 The most complex, most expensive caviar the Seattle Caviar Company has to offer. Next best thing to Beluga caviar. 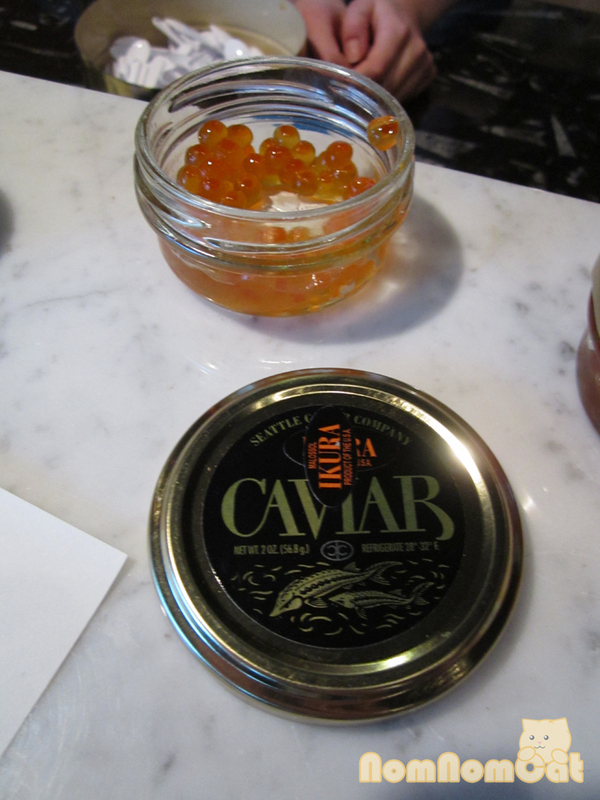 The Seattle Caviar Company is conveniently located just off Eastlake Avenue. 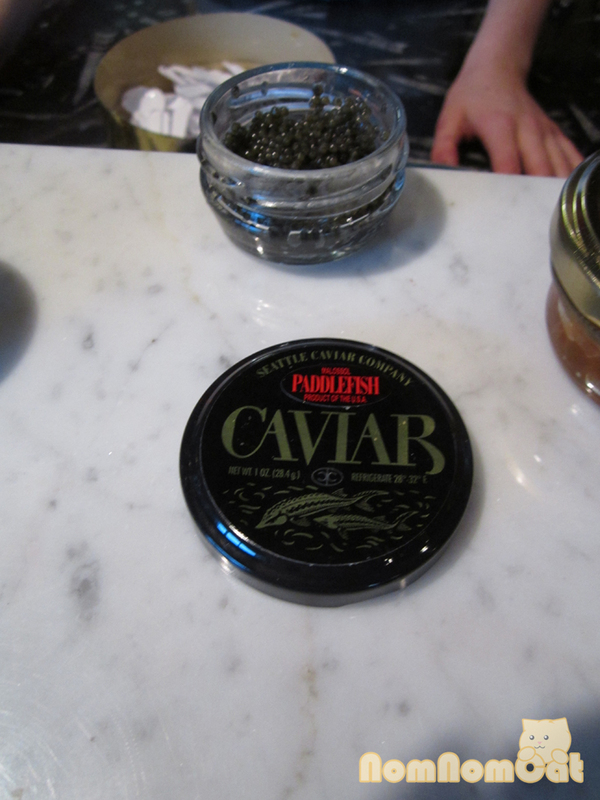 Brittany, our caviar guide, was very friendly and knowledgeable. 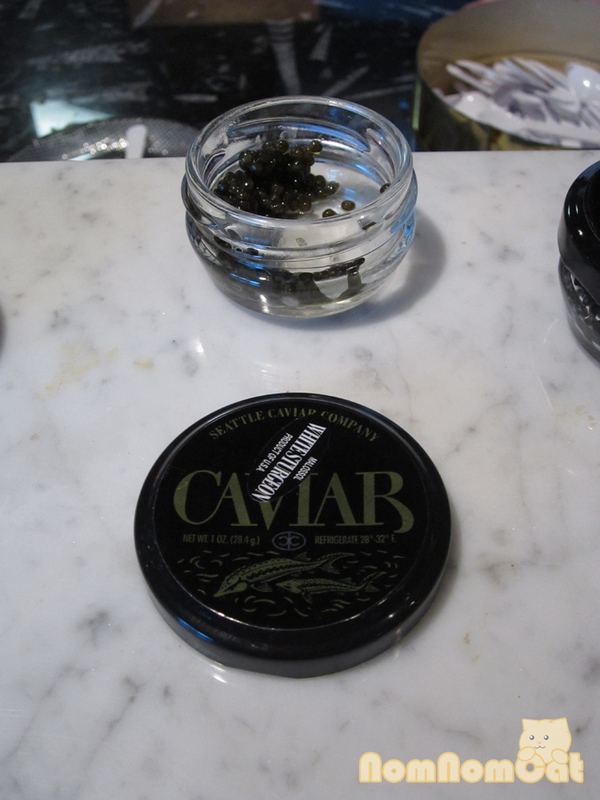 This visit definitely made our day and we highly recommend making caviar tasting a part of your next trip to Seattle! $10 per person tastings, and a $10 flute of French champagne if desired. What we hadn’t anticipated about holiday travel was just how many places would be closed on Christmas Day. We asked around for ideas on what to do, and the general consensus seemed to be “Go to Chinatown.” Sounds like a plan! Christmas morning, while children around the world are eagerly tearing up wrapping paper to uncover their presents, we stood outside of a cramped doorway packed with others who apparently had the same idea that we did – DIM SUM. Harbor City Restaurant and its neighbor Jade Garden Restaurant are local favorites for this weekend brunch of sorts. Did you know that dim sum is thought to have given rise to the Western concept of brunch? Who would’ve thought that thousands of years of traditional ‘yum cha’ with hot tea and dumplings would one day evolve into pancakes and French toast. But I digress. Harbor City has one cart that holds most of the steamed items, and the waitstaff brings out the stirfried, fried, and baked items on trays in batches as the kitchen rotates through its repertoire. 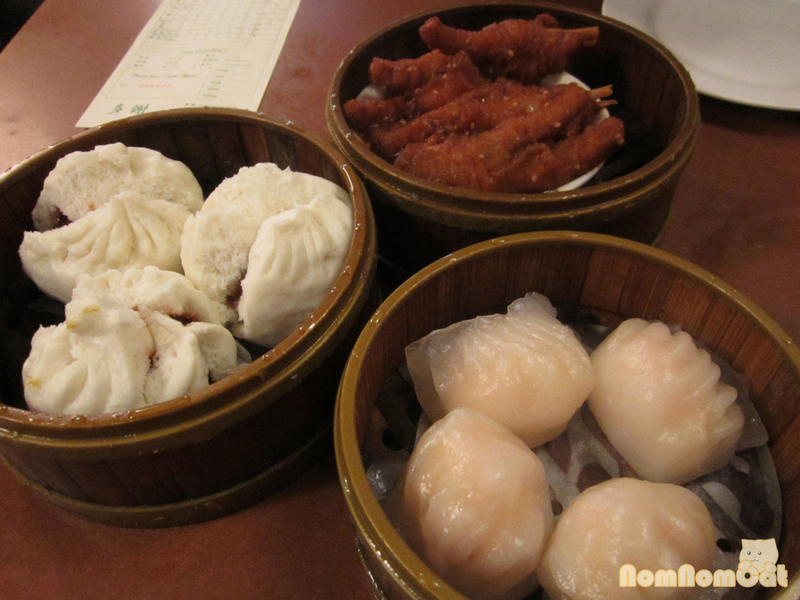 We ordered the staples: har gow, cha siu pao, chicken feet, turnip cake… oh my! The har gow had a nice and sticky wrapper the way I like it, and the shrimp filling was moist and succulent. 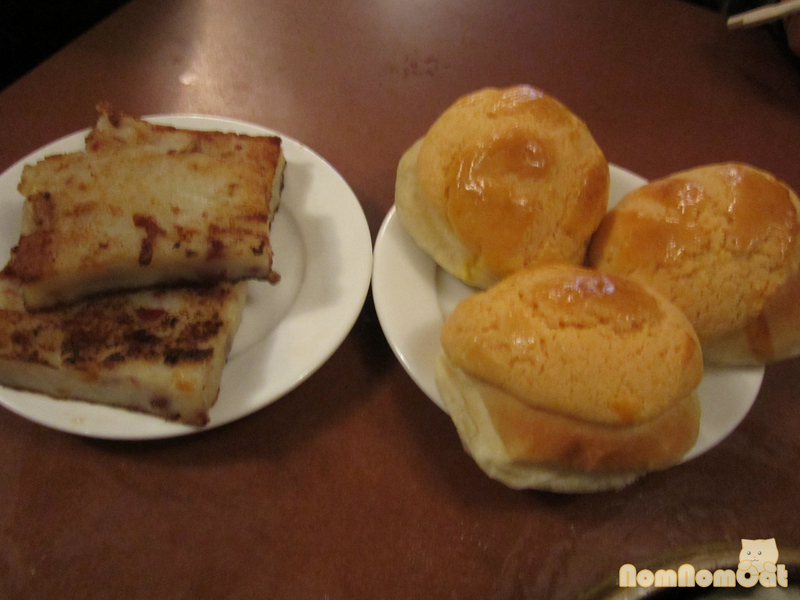 The cha siu pao, touted as some of the best you could find in Seattle, were hot and fluffy. The barbecue pork filling was a little sweet for my liking, but the texture was perfect. And the chicken feet, if that’s your thing, were flavorful. The turnip cake (below) was crispy on the outside and had bits of lap xuong (Chinese sausage) throughout the turnip dough/paste. 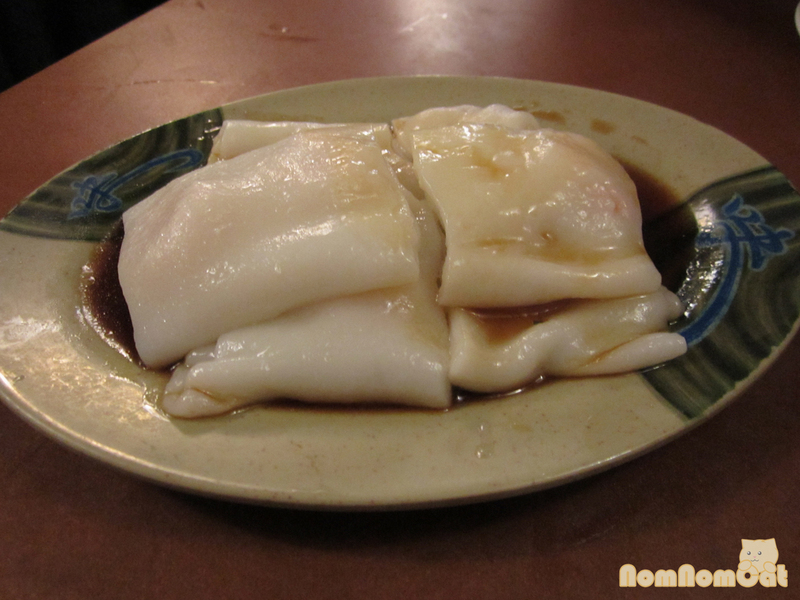 We noticed a lack of our favorite steamed dish – xia chang fun (steamed rice noodle sheets with shrimp, served with a generous drizzle of sweet soy sauce), so we asked our server and she very eagerly brought out our request straight from the kitchen. Ask and you shall receive, indeed! It was warm and fresh with the familiar slippery texture. 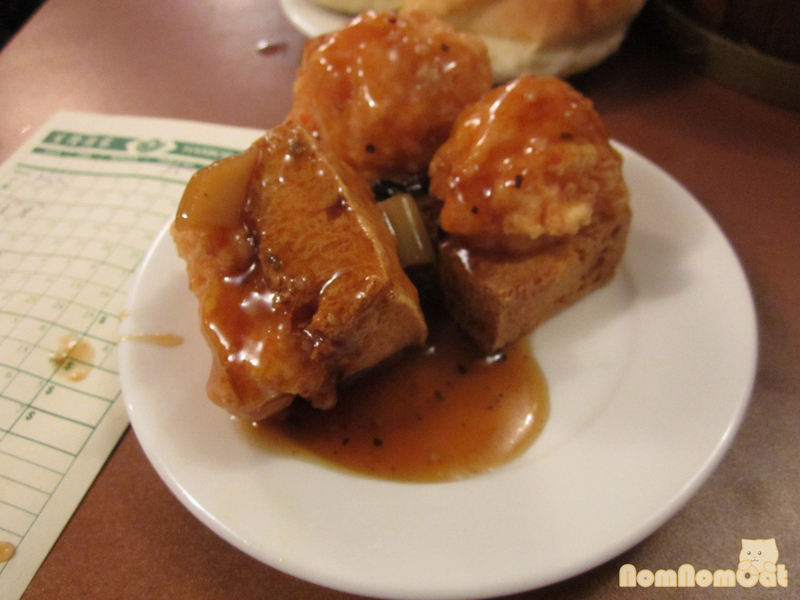 We usually forgo the assortment of entrees and deep-fried offerings, but a pleasant surprise was the crispy shrimp and tofu – a cube of tofu topped with a dollop of shrimp paste, all battered, deep fried, and served with a sweet and sour sauce. Yum! They were wonderful and fresh, but be careful because they come out of the kitchen piping hot! 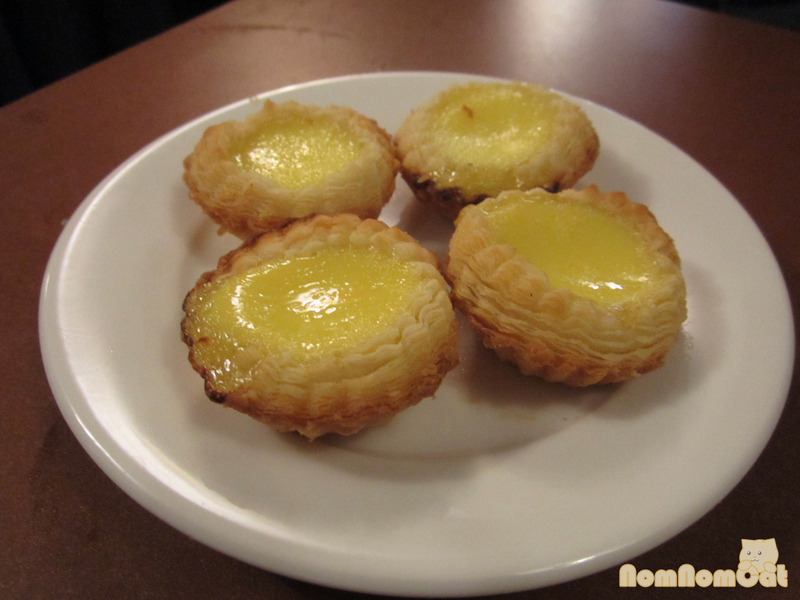 For dessert, we had the usual – bor lor bao, dahn tat (egg tarts), and mango pudding. 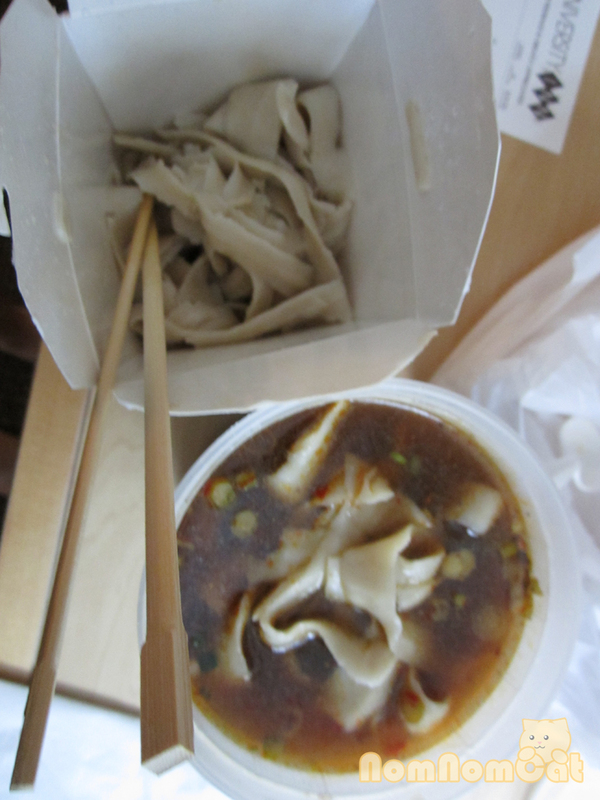 After polishing off the last savory dumpling, I dove in a bor lor bao (pictured above). Translated as “pineapple bun”, these baked goodies don’t actually contain pineapple (although some do) but are named for the way the top crust crumbles and looks like the pattern of a pineapple. These were filled with a sweet egg custard. Not the best I’ve had but they certainly satisfied my craving! The dahn tat here are smaller (and cuter!) than those at some other dim sum places. It has a great flaky crust to custard filling ratio. I could eat a dozen more of these! Just as how no dim sum experience for me is complete without bor lor bao, so does Martin feel about ending his dim sum meal with mango pudding. 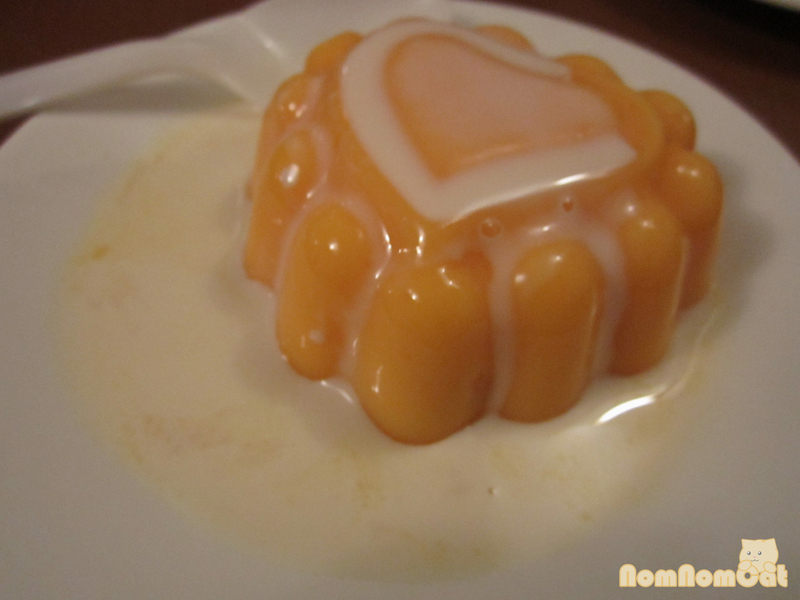 The mango pudding here has bits of a chewier mango jelly, and the main pudding has a more ripe mango flavor and a less from-the-box taste than other places. And of course you can’t go wrong with a drizzle of sweetened condensed milk! As if that wasn’t enough to fuel us for the rest of the day, we wandered around and ended up stopping by Purple Dot Cafe. Rei had taken me here years ago when I visited, and I still remember her excitement over the black-and-white checkered jello. 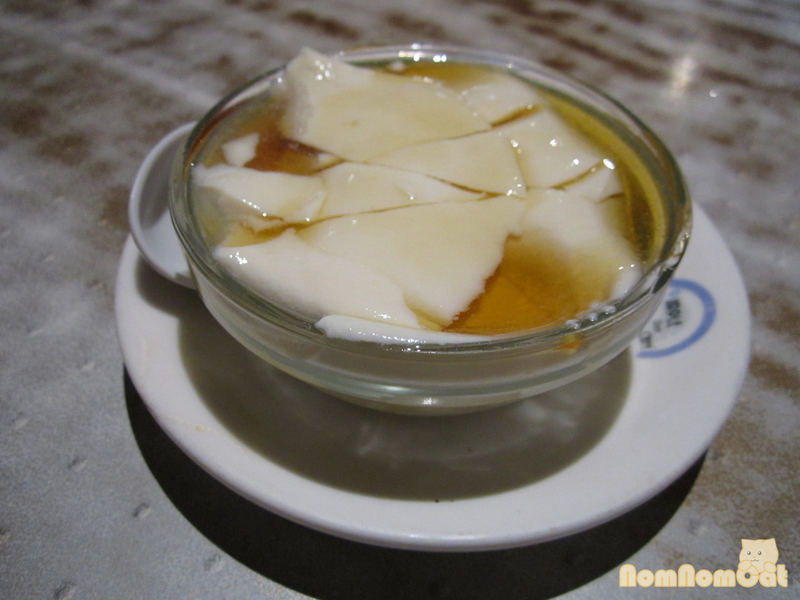 What brought us in, though, was the Hong Kong style milk tea and a dessert missing from Harbor City: sweet steamed tofu. Freshly made silken tofu topped with a simple syrup and ginger concoction, it’s the perfect way to truly complete a meal of dim sum. We realized that dinner would be hard to come by later on, so we planned ahead! First we stopped by A Piece of Cake; we had passed it on our walk between the station and Harbor City and marveled at the cake displays through the window. I just couldn’t pass up the opportunity to go inside and take home a slice! 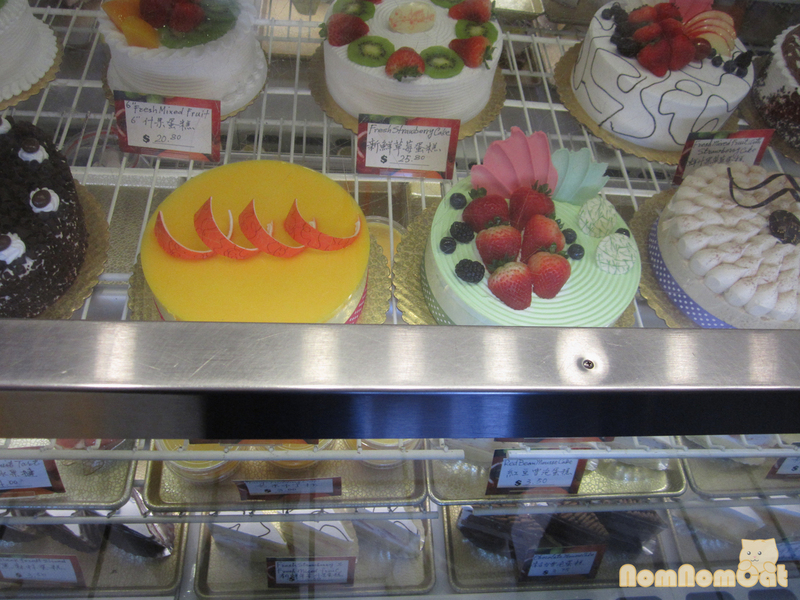 My eyes darted around at the sheer quantity of beautifully decorated cakes, my stomach growled and my mind became increasingly overwhelmed by the choices. Such a beautiful cake display at A Piece of Cake! 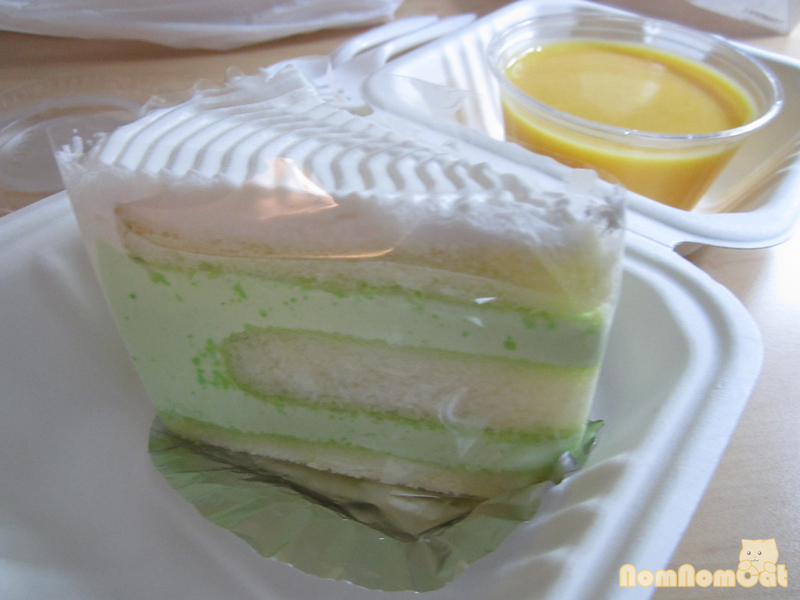 Finally, I saw it — the green tea honeydew mousse cake — and I just knew it would be the one. Martin already had his heart set on the mango pudding cup, so it was an easy transaction. Dessert in hand, we hopped down the block to Henry’s Taiwan, a place known to the locals as serving up some of the best night market style food. I opted for the must-try dish — beef shaved noodle soup. I asked it spicy and for the noodles to be kept separate so they don’t expand and get mushy before I get the chance to enjoy them. Martin perused the menu for some time before settling on the Shanghai wonton soup and an order of sticky rice from the dim sum offerings. Christmas dinner in the hotel while watching The Travel Channel might sound less than ideal to some, but I think Martin and I made the best of it and ended up having a great evening. Our room came equipped with a microwave to reheat our meal and a set of table and chairs at which to enjoy it. My soup already smelled amazing but wow, I could eat those hand-shaven freshmade noodles with just the broth all day long and be happy as a clam. They were generous with the beef, which was fatty and cartilaginous just like Mom would make. The dessert was delicious as well — the cake was moist and the layers of creme were not too sweet, just the way I like it. Martin seemed to enjoy his mango pudding, but I think it could have used some condensed milk to make it even better. All in all, we had a very merry Christmas with good food and good company. Despite most places being closed for business, we managed to uncover some great finds in Chinatown, a very worthwhile second day in Seattle. Their hours are crazy – opening at 8:30am every day and not closing until midnight on the weekends. This year for our holiday vacation, the one time of the year when nonprofit and for-profit organizations alike are more generous with approving Paid Time Off, Martin and I decided to take a week off to travel north and really experience winter (we heard LA was having summer in December while we were gone – consider us a bit envious). Our first stop in our One Week, Three Cities series: Seattle. At the recommendation of my friend Rei who had lived in Seattle for a few years during her undergrad at UW, we made reservations for Christmas Eve dinner at Elliott’s Oyster House on the Waterfront. Whenever I dine at a seafood restaurant, my dad’s wise words of “Only eat oysters in months ending in -ber” ring in my head. Luckily for us, it’s DecemBER and we had ourselves an oyster feast! 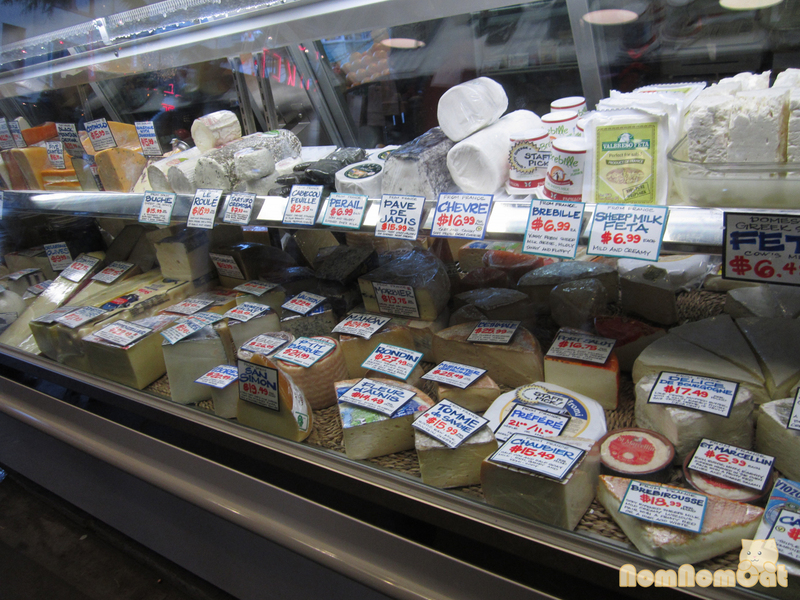 We started with a sampler dozen – four each of the Chelsea Gems, Effingham Inlet, and Kusshi. – Chelsea Gem Oysters: The menu says these are considered one of finest in world and we could see why. They were sweet and buttery, with just a hint of brininess. – Effingham Inlet / Barkley Sound, BC: These were a good size and tasted briny and delicious. My favorite of the night, I dare say. – Kusshi / Vancouver Island, BC: We came to the consensus that this one is like the awkward little brother that can’t decide whether to be sweet or briny. 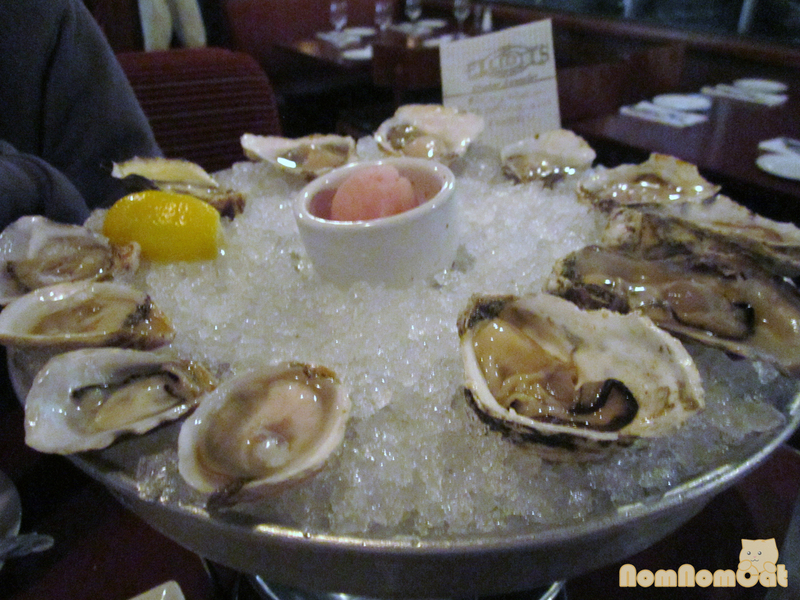 The oysters come with the option of a traditional cocktail sauce or the housemade champagne mignonette, which I definitely recommend. 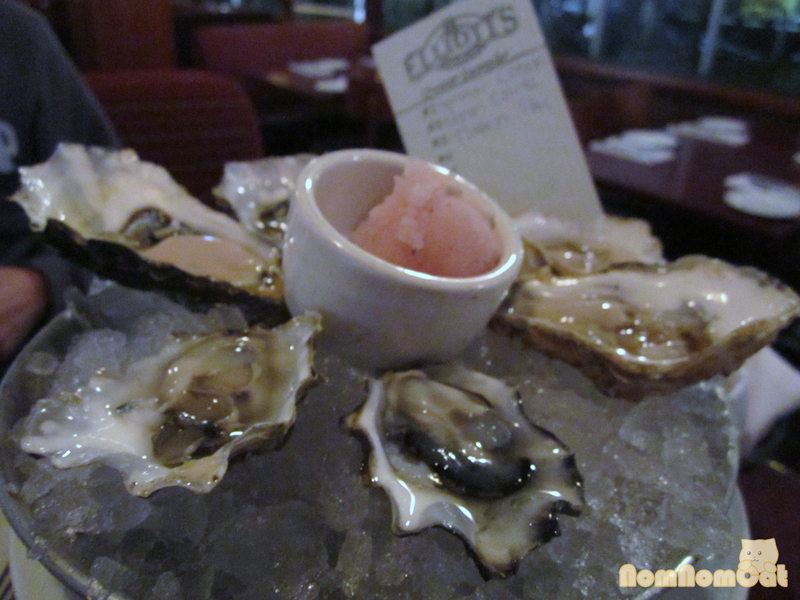 Elliot’s serves it as a sorbet, so you get a fruity, icy element atop the briny bivalve. Yum! They also recommend pairing the oysters with the local favorite Chateau Ste. Michelle chardonnay, but I opted for the riesling from the same winery in hopes of a sweeter wine and it did not disappoint! We also got some of the hot appetizers as well to round things out. The crispy geoduck strips with poppy seed aioli were crispy and nicely fried, but the batter and cooking method drowned out the flavor of the geoduck. I think we’ll try the tartare, the other geoduck item on the menu, next time to get more of its natural flavor. Our other app was the dungeness crab cakes with sweet chili lime beurre blanc and chayote jicama slaw. The crab cakes were deliciously pan seared and consisted of so much lump crab meat that it fell apart for want of breadcrumbs or egg yolk. The sauce was reminiscent of the Asian chili sauce you eat with lumpia, so that was… interesting. 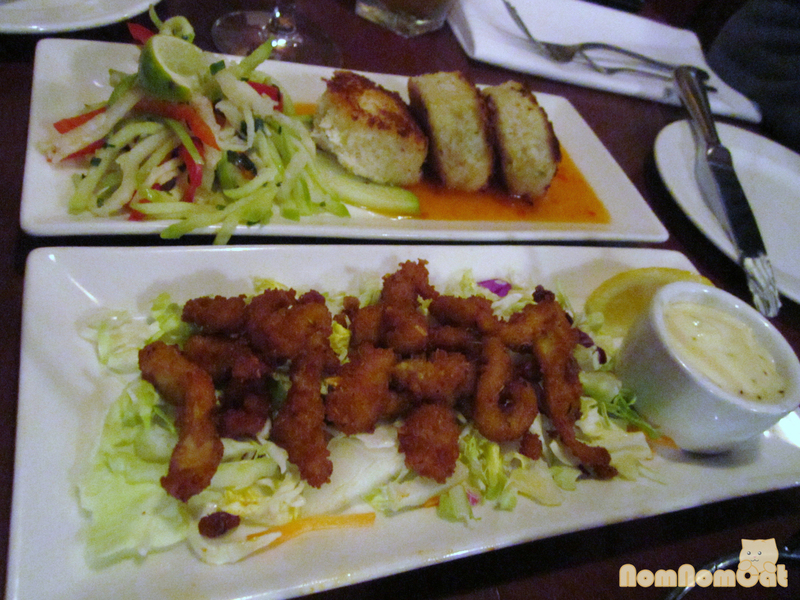 The slaw was wonderfully crunchy and contrasted well with the fried dishes. Round 2 – another half-dozen sampler ($17) – two each of the Totten Inlet, Penn Cove, and Snow Creek. – Totten Inlet (WA): Martin described it as a slap in the face of brininess that eventually mellows out sweet. 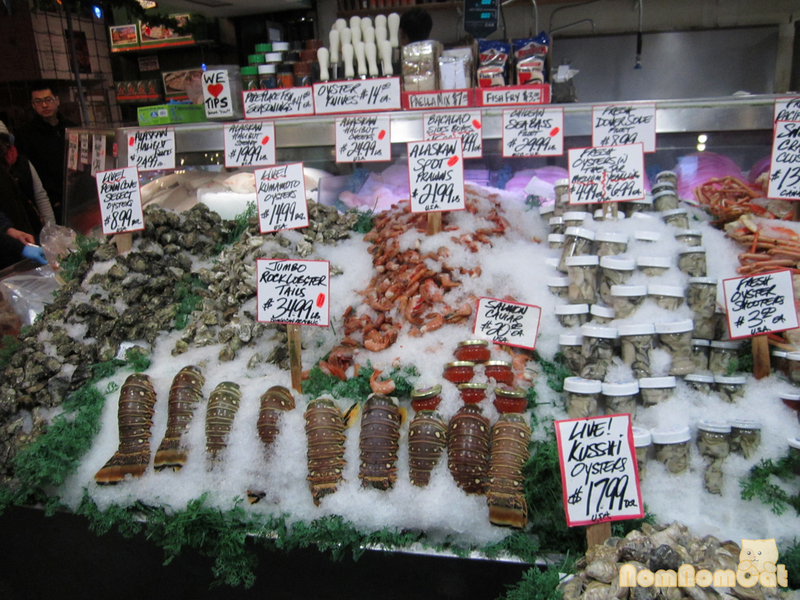 – Penn Cove (WA): apparently a local favorite. We felt these were well balanced in flavor but they didn’t particularly wow me. What’s a holiday dinner without dessert? We both spotted the sunken chocolate souffle a la mode and decided to go with that. 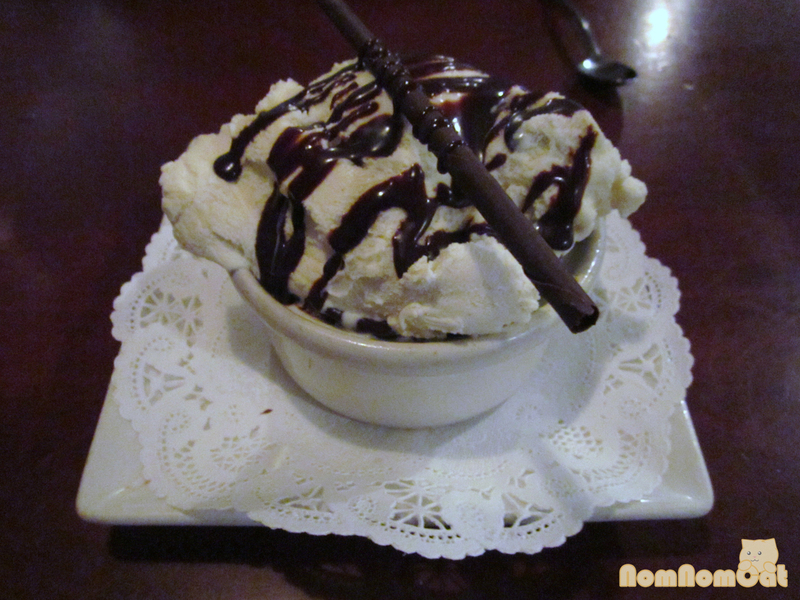 I suspect they put “sunken” in the name in case it doesn’t rise like a “true” souffle, because our dessert turned out to be a delicious lava cake of sorts filled with dark chocolate ganache and topped with Madagascan vanilla ice cream. A decadent way to end our meal! 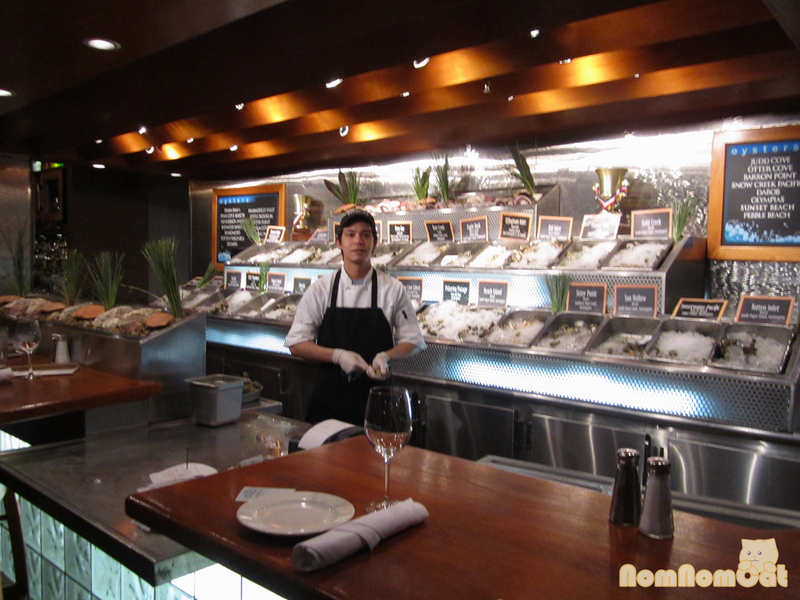 Elliott’s prides itself on serving eco-friendly, sustainable seafood. Food aside, the service was top notch, the decor was inviting, and the restaurant itself is easy to find right when you get to the Waterfront. I couldn’t think of a better place for us to celebrate Christmas Eve, and we will definitely come back next time we’re in town!